ePublishing Knowledge BaseePublishing Knowledge BaseePublishing Knowledge Base PollsHow do I view poll results? If a poll has been published and readers have submitted their feedback, those statistics will appear within the poll’s questions when editing in the Poll Manager. Open the poll, and click Question under Edit>. 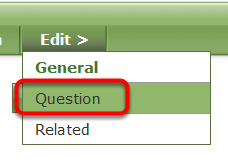 Click the second icon next to the question to open that question, including its results. Scroll down to view results, including the number of responses and the percentages. Zoom: Scroll down to view results, including the number of responses and the percentages. Prev: How do I change the order of questions in a poll? Next: How do I delete a poll?